Sunset near the Grand Traverse Lighthouse *For information on purchasing prints and canvas gallery wraps, click the "Purchasing" tab at the top of the page. If viewing on your mobile device, scroll to the bottom of the page and click the "Full Site" tab to view as if you were on your home PC and then go to the "Purchase" tab to for purchasing info. In mobile mode, you will not see the standard navigation bar with the "Purchase" tab. 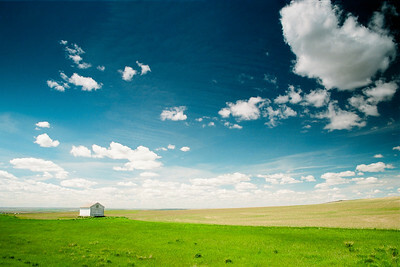 I took this shot of the high plains in early summer while heading west on US 2 in eastern Montana. *For information on purchasing prints and canvas gallery wraps, click the "Purchasing" tab at the top of the page. If viewing on your mobile device, scroll to the bottom of the page and click the "Full Site" tab to view as if you were on your home PC and then go to the "Purchase" tab to for purchasing info. In mobile mode, you will not see the standard navigation bar with the "Purchase" tab. 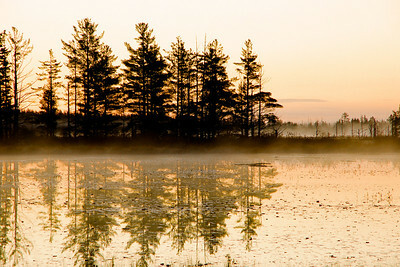 A small unnamed lake north of Newberry MI *For information on purchasing prints and canvas gallery wraps, click the "Purchasing" tab at the top of the page. If viewing on your mobile device, scroll to the bottom of the page and click the "Full Site" tab to view as if you were on your home PC and then go to the "Purchase" tab to for purchasing info. In mobile mode, you will not see the standard navigation bar with the "Purchase" tab. A Lake Superior Sunset in the Porcupine Mountains Wilderness State Park north of Wakefield MI *For information on purchasing prints and canvas gallery wraps, click the "Purchasing" tab at the top of the page. If viewing on your mobile device, scroll to the bottom of the page and click the "Full Site" tab to view as if you were on your home PC and then go to the "Purchase" tab to for purchasing info. In mobile mode, you will not see the standard navigation bar with the "Purchase" tab. 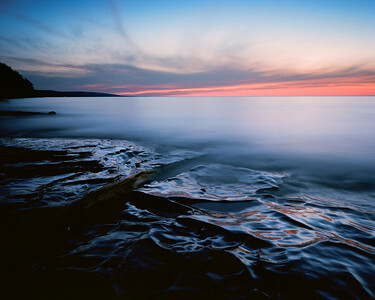 A 2.5 minute exposure 45 minutes after the sun dropped below Lake Superior on Miners Beach at the end of Co Rd H-13 north-northeast of Munising MI. When i showed up to photograph the small unnamed waterfall that drops off the sandstone at the east end of the beach, there were 30 photographers (no kidding) all set up with their tripods to photograph the waterfall and then the sunset once the light got too low for the waterfall. I had photographed the falls at the end of the beach a few times before so i already had a couple decent shots and didn't worry much about getting another (especially since i would have practically the same shot as the other 30 photographers). So i wandered around the corner east of the waterfall and set up for a few different shots (that nobody else would get lol). Over time as the sun went down i would peek around the corner to see how many photographers were still there photographing. Almost every one of the 30 were still there. After the sun set below the horizon, i peeked around the corner again and found that every one of the photographers had packed up and left. I smiled and thought to myself "too bad for them.... that's their loss". As they packed their gear into their cars and drove off down that dusty dirt road, I stood alone recording on film, the best light of the night. I've found time and time again that the best light happenes within 20 to 45 minutes after the sun actually sets below the horizon line. The light gets soft and low which enables long exposures that lets some of the most amazing light paint itself across my cameras film and create some really moody feeling photographs like this one. Off in the distance is Grand Island and the last remaining light of the evening. Below the island is a water reflection of the remaining light from the sky, when over a course of 2.5 minutes, (with the help of the waves) the light painted itself on the water like a painter would brush on a canvas. *For information on purchasing prints and canvas gallery wraps, click the "Purchasing" tab at the top of the page. If viewing on your mobile device, scroll to the bottom of the page and click the "Full Site" tab to view as if you were on your home PC and then go to the "Purchase" tab to for purchasing info. In mobile mode, you will not see the standard navigation bar with the "Purchase" tab. This is one of my personal favorites. I was heading north on MI-123 to photograph Tahquamenon Falls on an early fall morning. I was roughly 10-15 min's north of Newberry when i passed this small lake/pond. I immediately locked them up, spun it around and headed back to take the shot. I was not at all expecting to be taking a shot before i arrived at the falls but when a good opportunity presents itself, you have to take it. 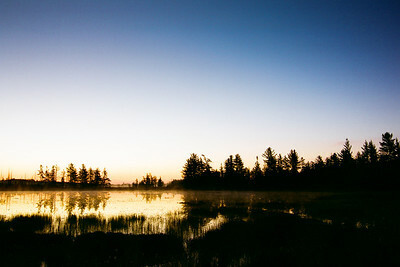 It was an unbelievable sunrise with a richly colored light transition from orange/yellow to blue and with the treeline, reflections, a slight haze on the water, and grasses in the foreground. I considered myself lucky to have been traveling through that very spot at that very time. 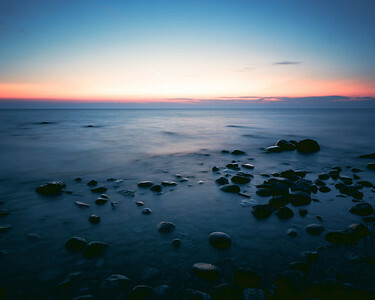 Taken around 30 minutes before the sun rose over the horizon. *For information on purchasing prints and canvas gallery wraps, click the "Purchasing" tab at the top of the page. If viewing on your mobile device, scroll to the bottom of the page and click the "Full Site" tab to view as if you were on your home PC and then go to the "Purchase" tab to for purchasing info. In mobile mode, you will not see the standard navigation bar with the "Purchase" tab. 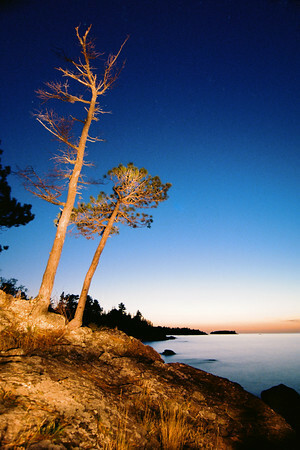 Seul Choix Point at sunrise.. Near the town of Gulliver MI *For information on purchasing prints and canvas gallery wraps, click the "Purchasing" tab at the top of the page. If viewing on your mobile device, scroll to the bottom of the page and click the "Full Site" tab to view as if you were on your home PC and then go to the "Purchase" tab to for purchasing info. In mobile mode, you will not see the standard navigation bar with the "Purchase" tab. 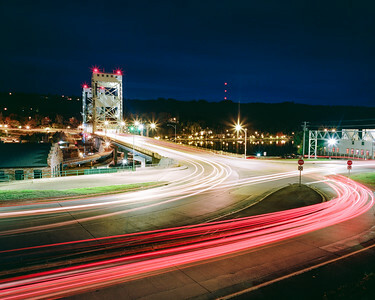 Portage Lake Lift Bridge downtown Houghton/Handcock MI *For information on purchasing prints and canvas gallery wraps, click the "Purchasing" tab at the top of the page. If viewing on your mobile device, scroll to the bottom of the page and click the "Full Site" tab to view as if you were on your home PC and then go to the "Purchase" tab to for purchasing info. In mobile mode, you will not see the standard navigation bar with the "Purchase" tab. 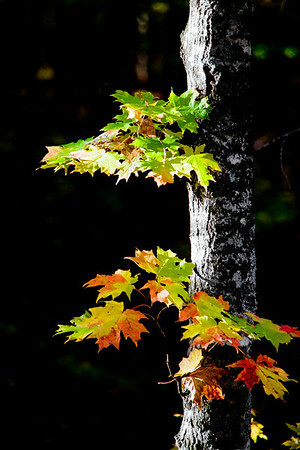 Autumn colors in Tahquamenon Falls State Park in Michigan's Upper Peninsula. *For information on purchasing prints and canvas gallery wraps, click the "Purchasing" tab at the top of the page. If viewing on your mobile device, scroll to the bottom of the page and click the "Full Site" tab to view as if you were on your home PC and then go to the "Purchase" tab to for purchasing info. In mobile mode, you will not see the standard navigation bar with the "Purchase" tab. Port Austin Sunset *For information on purchasing prints and canvas gallery wraps, click the "Purchasing" tab at the top of the page. If viewing on your mobile device, scroll to the bottom of the page and click the "Full Site" tab to view as if you were on your home PC and then go to the "Purchase" tab to for purchasing info. In mobile mode, you will not see the standard navigation bar with the "Purchase" tab. *For information on purchasing prints and canvas gallery wraps, click the "Purchasing" tab at the top of the page. If viewing on your mobile device, scroll to the bottom of the page and click the "Full Site" tab to view as if you were on your home PC and then go to the "Purchase" tab to for purchasing info. In mobile mode, you will not see the standard navigation bar with the "Purchase" tab. 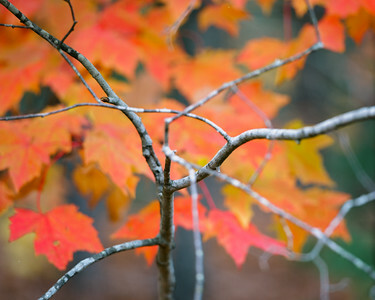 An autumn maple in Porcupine Mountain Wilderness State Park north of Wakefield MI *For information on purchasing prints and canvas gallery wraps, click the "Purchasing" tab at the top of the page. If viewing on your mobile device, scroll to the bottom of the page and click the "Full Site" tab to view as if you were on your home PC and then go to the "Purchase" tab to for purchasing info. In mobile mode, you will not see the standard navigation bar with the "Purchase" tab. Sunset, Lake Superior *For information on purchasing prints and canvas gallery wraps, click the "Purchasing" tab at the top of the page. If viewing on your mobile device, scroll to the bottom of the page and click the "Full Site" tab to view as if you were on your home PC and then go to the "Purchase" tab to for purchasing info. In mobile mode, you will not see the standard navigation bar with the "Purchase" tab. 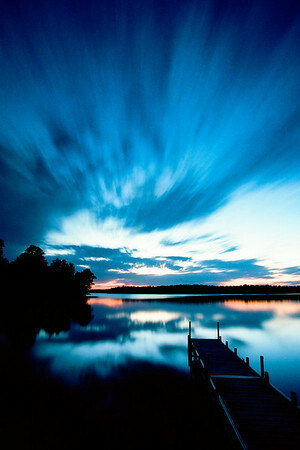 This is a 5 minute exposure of sunset on Namekagon Lake in northern Wisconsin near the town of Cable. Pulling a 5 minute exposure allowed the clouds to paint themselves across my film as they moved east in the falling dark. *For information on purchasing prints and canvas gallery wraps, click the "Purchasing" tab at the top of the page. If viewing on your mobile device, scroll to the bottom of the page and click the "Full Site" tab to view as if you were on your home PC and then go to the "Purchase" tab to for purchasing info. In mobile mode, you will not see the standard navigation bar with the "Purchase" tab. 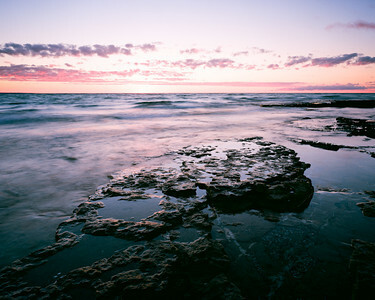 This particular shot is my number 1 favorite of all my experiences taking landscape photographs. I've named this shot "In The Falling Dark" after a Bruce Cockburn masterpiece. (If you've ever heard this song, you would understand.) 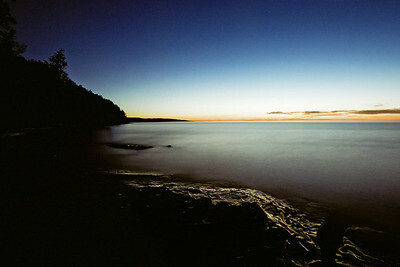 This 2.5 minute exposure was taken 45 minutes after the sun set below Lake Superior on an unseasonably warm October night. 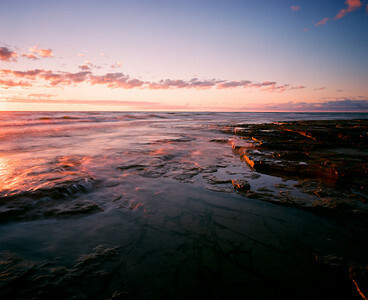 There is absolutely nothing like standing on a Lake Superior shoreline as the world and the last light fades off into tomorrows time. 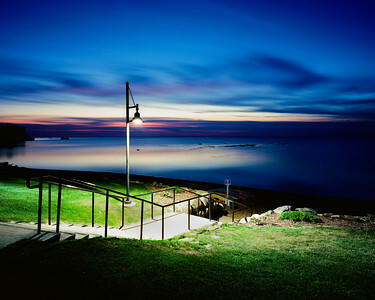 I just hope that through my photograph, i can relay at least a fraction of my experience to you. As Elie Wiesel stated, "Not to transmit an experience is to betray it." 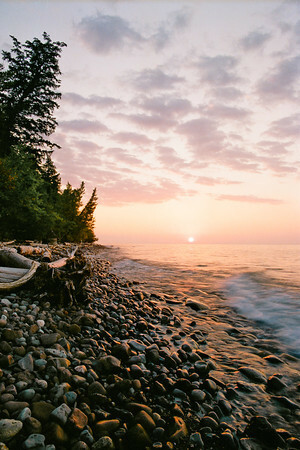 This particular section of Michigan's Lake Superior coastline is in the Porcupine Mountains Wilderness State Park about 20-25 minutes north of Wakefield at the end of County Road 519. 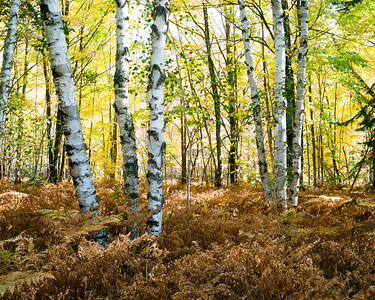 The Porcupine Mountains Wilderness State Park is probably my favorite place to photograph in Michigan. It's rocky beaches and coastline, dense hardwood forest, Presque Isle River and many waterfalls along the river and throughout the park make this a place I could photograph almost everyday and never get bored of shooting. If you've never been, I highly recommend you make the effort. 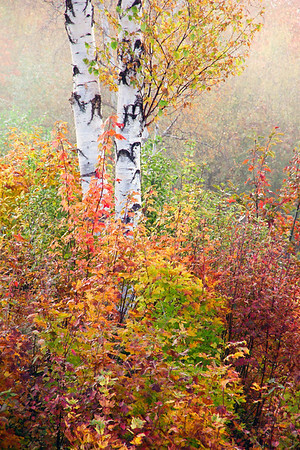 The 1st and 2nd week of October is usually the prime time for fall colors in this region of the U.P... and believe me, the colors in this park are amazing. *For information on purchasing prints and canvas gallery wraps, click the "Purchasing" tab at the top of the page. If viewing on your mobile device, scroll to the bottom of the page and click the "Full Site" tab to view as if you were on your home PC and then go to the "Purchase" tab to for purchasing info. In mobile mode, you will not see the standard navigation bar with the "Purchase" tab. 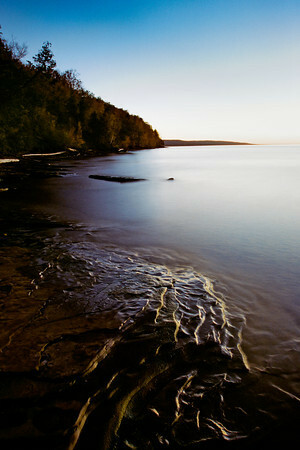 A 1.5 minute exposure of a sunset on Miners Beach at the end of Co Rd H-13 north-northeast of Munising MI on Lake Superior. *For information on purchasing prints and canvas gallery wraps, click the "Purchasing" tab at the top of the page. If viewing on your mobile device, scroll to the bottom of the page and click the "Full Site" tab to view as if you were on your home PC and then go to the "Purchase" tab to for purchasing info. In mobile mode, you will not see the standard navigation bar with the "Purchase" tab. 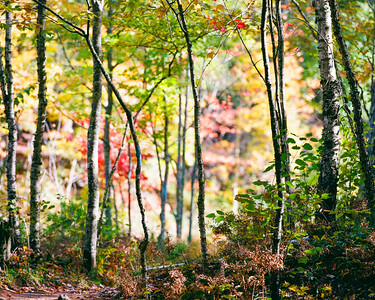 North Country Trail near the Presque Isle River in Porcupine Mountains Wilderness State Park *For information on purchasing prints and canvas gallery wraps, click the "Purchasing" tab at the top of the page. If viewing on your mobile device, scroll to the bottom of the page and click the "Full Site" tab to view as if you were on your home PC and then go to the "Purchase" tab to for purchasing info. In mobile mode, you will not see the standard navigation bar with the "Purchase" tab. 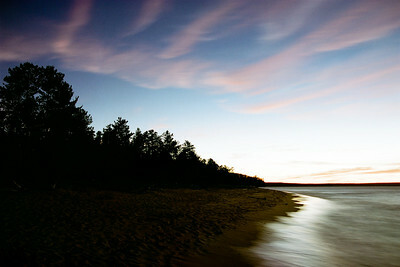 A little fun with my flashlight during a sunset on Lake Superior, between Eagle Harbor and Copper Harbor. *For information on purchasing prints and canvas gallery wraps, click the "Purchasing" tab at the top of the page. If viewing on your mobile device, scroll to the bottom of the page and click the "Full Site" tab to view as if you were on your home PC and then go to the "Purchase" tab to for purchasing info. In mobile mode, you will not see the standard navigation bar with the "Purchase" tab. From a roadside pull out on US HWY 2, 10-20 minutes west of Mackinaw City MI *For information on purchasing prints and canvas gallery wraps, click the "Purchasing" tab at the top of the page. If viewing on your mobile device, scroll to the bottom of the page and click the "Full Site" tab to view as if you were on your home PC and then go to the "Purchase" tab to for purchasing info. In mobile mode, you will not see the standard navigation bar with the "Purchase" tab. A foggy autumn morning taken right off of Borgstrom Rd about 10 minutes north of Garnet MI. *For information on purchasing prints and canvas gallery wraps, click the "Purchasing" tab at the top of the page. If viewing on your mobile device, scroll to the bottom of the page and click the "Full Site" tab to view as if you were on your home PC and then go to the "Purchase" tab to for purchasing info. In mobile mode, you will not see the standard navigation bar with the "Purchase" tab. This is one of my personal favorites. I was heading north on MI-123 to photograph Tahquamenon Falls on an early fall morning. I was roughly 10-15 min's north of Newberry when i passed this small lake/pond. I immediately locked them up, spun it around and headed back to take the shot. I was not at all expecting to be taking a shot before i arrived at the falls but when a good opportunity presents itself, you have to take it. 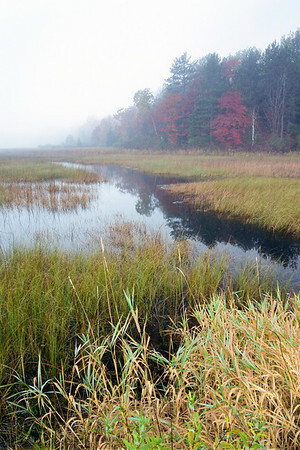 It was an unbelievable sunrise with a richly colored light transition from orange/yellow to blue and with the treeline, reflections, a slight haze on the water, and grasses in the foreground. I considered myself lucky to have been traveling through that very spot at that very time. 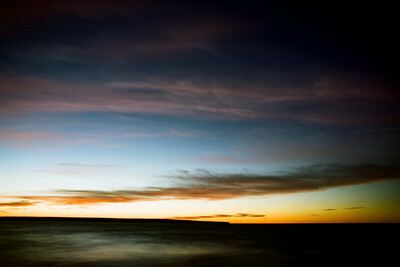 Taken around 30 minutes before the sun rose over the horizon.